I’m dreaming big–because all of heaven is dreaming big,” Adams continues. “Jesus died for our sins. That was the best gift God could give us,” he says. “But we have something else. Because I want to follow Jesus and do what he ordained, God wants to support us. It’s Joel Osteen’s ministry that told me. Why would an awesome and mighty God want anything less for his children? “In three of the Gospels, Jesus warns that each of his disciples may have to “deny himself” and even “take up his Cross.” In support of this alarming prediction, he forcefully contrasts the fleeting pleasures of today with the promise of eternity: “For what profit is it to a man,” he asks, “if he gains the whole world, and loses his own soul?” It is one of the New Testament’s hardest teachings, yet generations of churchgoers have understood that being Christian, on some level, means being ready to sacrifice–money, autonomy or even their lives. Jesus has become an enterprise. He is not worshiped. He is used like a charm, magic spell, and elixir to get what people really want. The cross has become the rung on the ladder to success. If Jesus can lift us up as we step on Him, we will succeed. 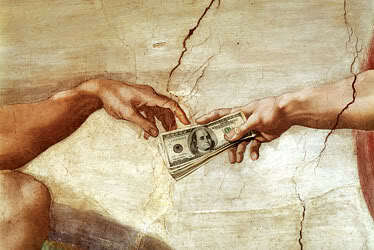 Giving to God (tithing) is yet another rung on the ladder to success. “Give more to God so He will give more to you!” Tithing is no longer an act of worship but a chant, a waiving of the wand if you will, replacing “abra cadabra!” to make the great door of success open wide. God Himself is no longer our goal, but merely a means to another end. God becomes the telescope that leads us to the very thing upon which our heart is set. Jesus said, “For where your treasure is, there will your heart be also.” He said this on the heals of, “Fear not, little flock, for it is your Father’s good pleasure to give you the kingdom. Sell your possessions, and give to the needy. Provide yourselves with moneybags that do not grow old, with a treasure in the heavens that does not fail, where no thief approaches and no moth destroys” (Luke 12:32-34). “I am astonished that you are so quickly deserting him who called you in the grace of Christ and are turning to a different gospel– not that there is another one, but there are some who trouble you and want to distort the gospel of Christ. But even if we or an angel from heaven should preach to you a gospel contrary to the one we preached to you, let him be accursed. As we have said before, so now I say again: If anyone is preaching to you a gospel contrary to the one you received, let him be accursed. For am I now seeking the approval of man, or of God? Or am I trying to please man? If I were still trying to please man, I would not be a servant of Christ” (Galatians 1:6-10). From Osteen’s perspective, Jesus is not a Savior, as much as, an Enterprise–a gospel that is no gospel at all. It’s amazing, I don’t think you relizae how empty your life is before Christ, but you sense there’s something more! I think I would have a lot less friends if it weren’t for my walk…relationships take work AND forgiveness too…still working on that process!